Download "CITRON & CITRON. History"
1 CITRON & CITRON 3420 Ocean Park Boulevard Suite 3030 Santa Monica, CA (310) (Telephone) (310) (Facsimile) *A Martindale Hubbell AV Pre-Eminent Rated Firm* History Founded in 1981, Citron & Citron has earned a reputation for excellence in the legal community. The practice is distinctive in its ability to respond to its clients' professional needs while also providing a high degree of personal service. Over the years, Citron & Citron has handled a broad spectrum of cases with an emphasis on trying complex, high exposure cases. 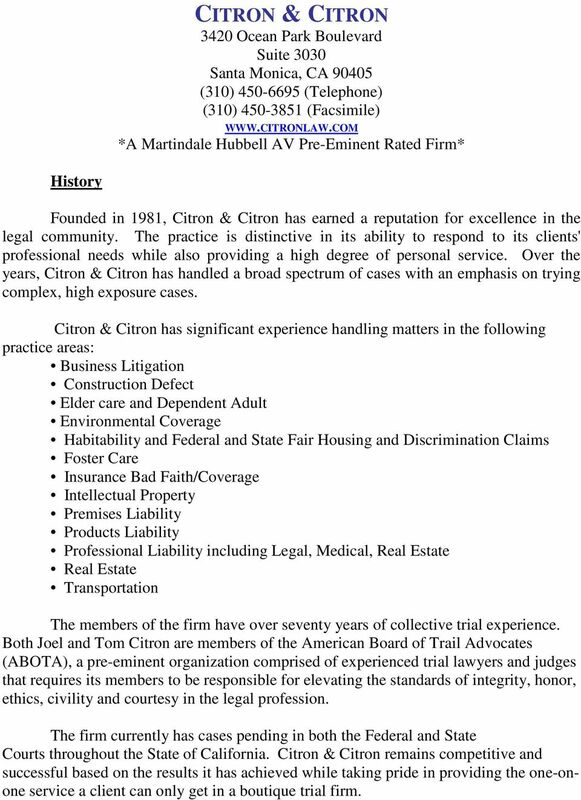 Citron & Citron has significant experience handling matters in the following practice areas: Business Litigation Construction Defect Elder care and Dependent Adult Environmental Coverage Habitability and Federal and State Fair Housing and Discrimination Claims Foster Care Insurance Bad Faith/Coverage Intellectual Property Premises Liability Products Liability Professional Liability including Legal, Medical, Real Estate Real Estate Transportation The members of the firm have over seventy years of collective trial experience. 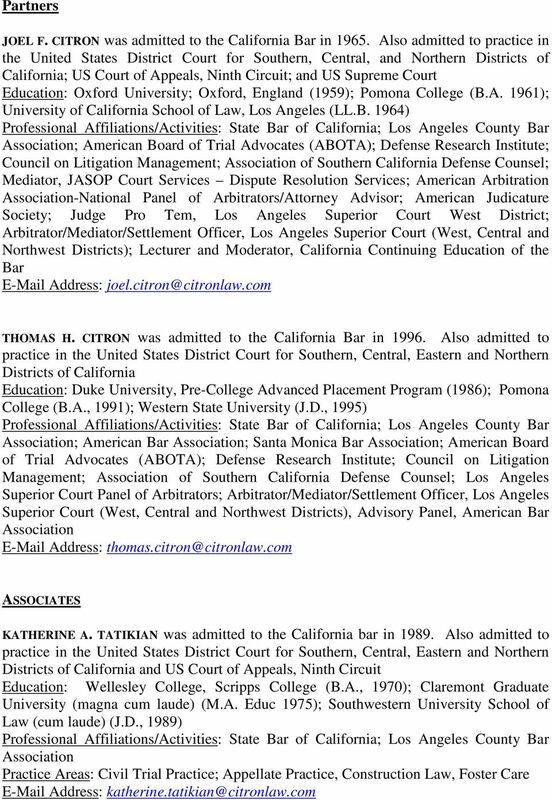 Both Joel and Tom Citron are members of the American Board of Trail Advocates (ABOTA), a pre-eminent organization comprised of experienced trial lawyers and judges that requires its members to be responsible for elevating the standards of integrity, honor, ethics, civility and courtesy in the legal profession. The firm currently has cases pending in both the Federal and State Courts throughout the State of California. Citron & Citron remains competitive and successful based on the results it has achieved while taking pride in providing the one-onone service a client can only get in a boutique trial firm. 2 Practice Areas Business Litigation: Citron & Citron attorneys regularly handle business disputes for their clients. Representative cases include, but are not limited to, contracts, commercial leases, land use, homeowners associations, fraud, wrongful termination, harassment, defamation misrepresentation and unfair competition/unfair business practices claims. Construction: The firm has considerable expertise in the areas of construction defect cases representing owners, developers, builders and design professionals. 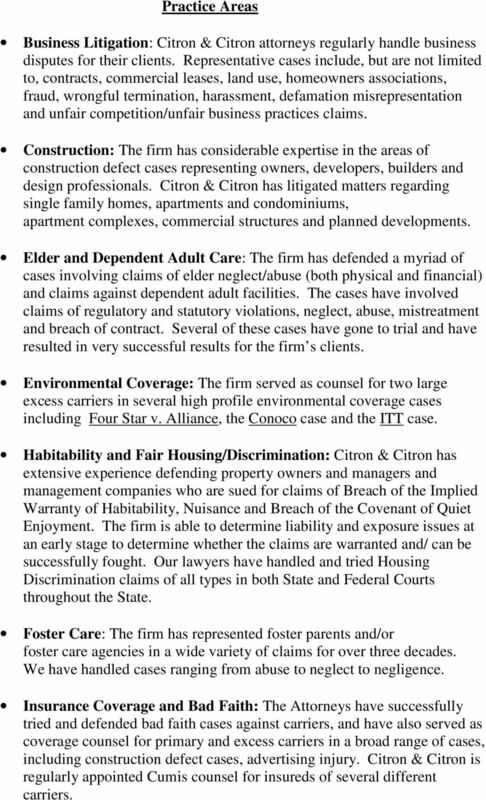 Citron & Citron has litigated matters regarding single family homes, apartments and condominiums, apartment complexes, commercial structures and planned developments. Elder and Dependent Adult Care: The firm has defended a myriad of cases involving claims of elder neglect/abuse (both physical and financial) and claims against dependent adult facilities. The cases have involved claims of regulatory and statutory violations, neglect, abuse, mistreatment and breach of contract. Several of these cases have gone to trial and have resulted in very successful results for the firm s clients. Environmental Coverage: The firm served as counsel for two large excess carriers in several high profile environmental coverage cases including Four Star v. Alliance, the Conoco case and the ITT case. Habitability and Fair Housing/Discrimination: Citron & Citron has extensive experience defending property owners and managers and management companies who are sued for claims of Breach of the Implied Warranty of Habitability, Nuisance and Breach of the Covenant of Quiet Enjoyment. The firm is able to determine liability and exposure issues at an early stage to determine whether the claims are warranted and/ can be successfully fought. Our lawyers have handled and tried Housing Discrimination claims of all types in both State and Federal Courts throughout the State. Foster Care: The firm has represented foster parents and/or foster care agencies in a wide variety of claims for over three decades. We have handled cases ranging from abuse to neglect to negligence. Insurance Coverage and Bad Faith: The Attorneys have successfully tried and defended bad faith cases against carriers, and have also served as coverage counsel for primary and excess carriers in a broad range of cases, including construction defect cases, advertising injury. 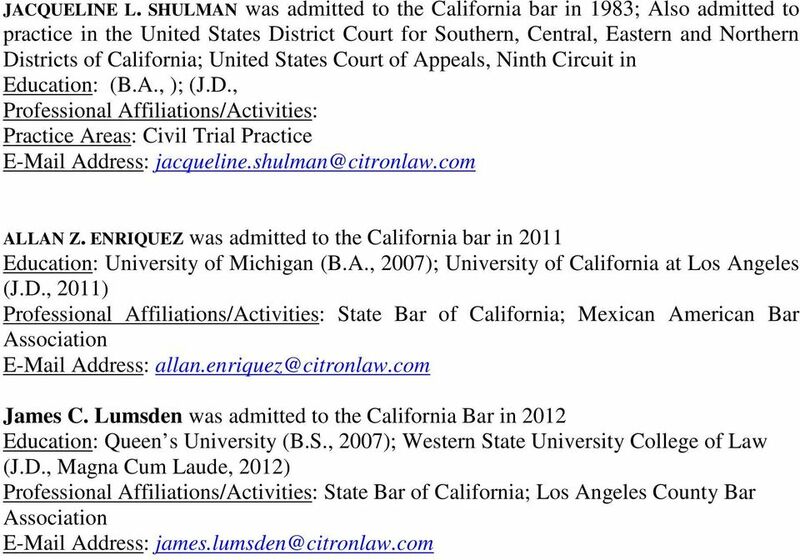 Citron & Citron is regularly appointed Cumis counsel for insureds of several different carriers. 3 Intellectual property/advertising Injury: Citron & Citron has successfully defended some of the largest advertising injury cases in Southern California on behalf of both primary and excess carriers. In addition thereto, they have had great recent success in defending cases involving claims of the alleged unauthorized use of the likeness of a professional artist, model and/or actor, and/or the unauthorized use of a trademark. 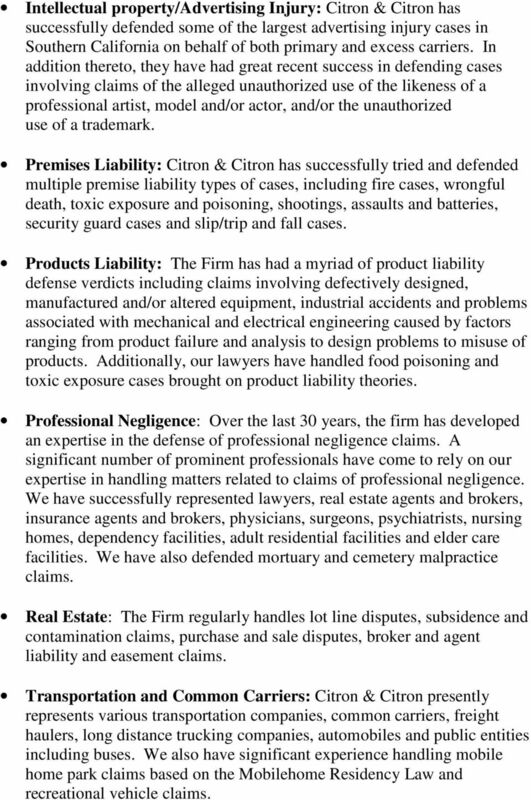 Premises Liability: Citron & Citron has successfully tried and defended multiple premise liability types of cases, including fire cases, wrongful death, toxic exposure and poisoning, shootings, assaults and batteries, security guard cases and slip/trip and fall cases. Products Liability: The Firm has had a myriad of product liability defense verdicts including claims involving defectively designed, manufactured and/or altered equipment, industrial accidents and problems associated with mechanical and electrical engineering caused by factors ranging from product failure and analysis to design problems to misuse of products. Additionally, our lawyers have handled food poisoning and toxic exposure cases brought on product liability theories. Professional Negligence: Over the last 30 years, the firm has developed an expertise in the defense of professional negligence claims. A significant number of prominent professionals have come to rely on our expertise in handling matters related to claims of professional negligence. We have successfully represented lawyers, real estate agents and brokers, insurance agents and brokers, physicians, surgeons, psychiatrists, nursing homes, dependency facilities, adult residential facilities and elder care facilities. We have also defended mortuary and cemetery malpractice claims. Real Estate: The Firm regularly handles lot line disputes, subsidence and contamination claims, purchase and sale disputes, broker and agent liability and easement claims. Transportation and Common Carriers: Citron & Citron presently represents various transportation companies, common carriers, freight haulers, long distance trucking companies, automobiles and public entities including buses. We also have significant experience handling mobile home park claims based on the Mobilehome Residency Law and recreational vehicle claims. R. LYLE CLEMENS BIOGRAPHY. Mr. Clemens is an AV rated attorney with a practice which emphasizes Mediation and Arbitration services. OUR ATTORNEYS. Karin P. Beam. Jocelyn Yeh Lin. Kevin J. McCullough. Warren L. Dranit. Douglas J. (DJ) Drennan. Mark A. Miller. Albert G.
Specialties & Sub-Specialties Commercial, consumer, employment, ERISA, personal injury, insurance, construction and business disputes.